Visual Classrooms gives you the option to create three kinds of activities: Discussions, Multiple choice questions, and Concept maps. To create a new Visual Classrooms activity, click on Activities in the Teacher Dashboard drop down menu. You should see a Manage Activities page similar to this. To add a new activity, select the button. Select the type of activity you are creating. 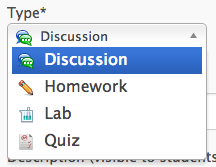 You can categorize activities as discussions, homework, labs, or quizzes.. Create a title for your new activity. Optional: Add a short description that will be visible to users. This could be anything from additional instructions to reminders to explain answers. 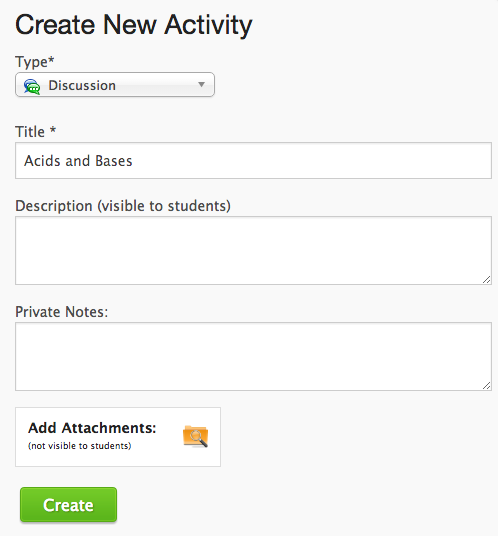 Optional: Add private notes or an attachment about the lesson. These notes and documents are not visible to students. Select the button and your new activity will be created. The next step is adding the content to your activity – what we call Prompts to guide students. The next sections will explain how to add various forms of content from text to videos to simulations and much more.